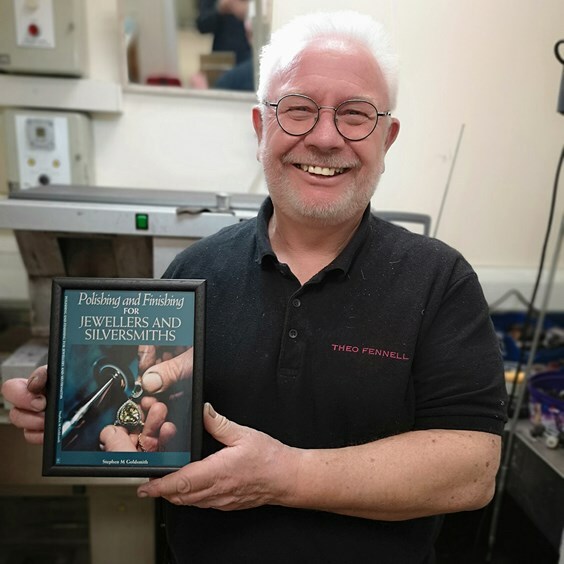 You may have seen Stephen's new book 'Polishing For Jewellers & Silversmiths' on our website as well as jewellers across social media sharing their love for it. We wanted to find out more about Stephen's background of being a professional polisher, his top tips and whether there could be another book! Hi Stephen, tell us about how your polishing journey started? I started my career at 15 at the Rochester College of Art and Design with a foundation course for a year, studying everything to do with the craft, right from design to silversmithing, jewellery, setting, polishing and ceramics. 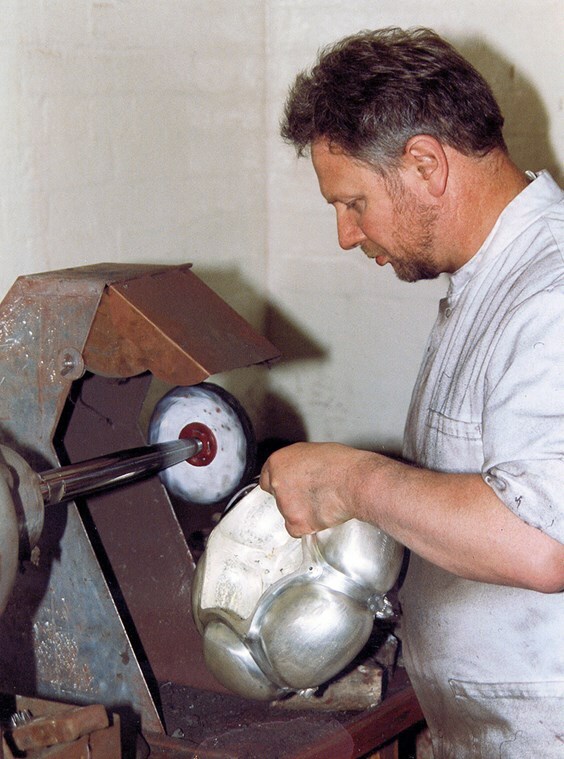 Once my year was up, I was indentured by The Worshipful Company of Goldsmiths’ into a polishing apprenticeship for 4 years with 3 years day release in silversmithing at my original college, I was employed by C.J Vander near Hatton Garden. I left my home in Canterbury at 16 to live in Islington Green, so I could easily get to work as my wages of £8 a week would never have covered my train fare. "I am reaching the time when you need to pass what I know on to the next generation..."
Congratulations on your book, ‘Polishing And Finishing For Jewellers And Silversmiths’ - what was the inspiration behind writing this book? I am reaching the time when you need to pass what I know on to the next generation. I have spent nearly 50 years in the trade and have managed to keep polishing in good health and with all my digits too! I started teaching in 2007 in Birmingham School of Jewellery, I run an international summer school where students spent up to 4 days with me from as far as Australia, USA and Europe. I carried on from there teaching at the Goldsmiths’ Centre in London, then Kilkenny, Dublin, Den Bosh in the Netherlands and I am opening a Jewellery School for Mark Lloyd of Hartlepool on the 24th of March. I have discovered I have a way of making polishing interesting and more fun and it’s very successful - when they announce the polishing master class, it usually sells out within hours. 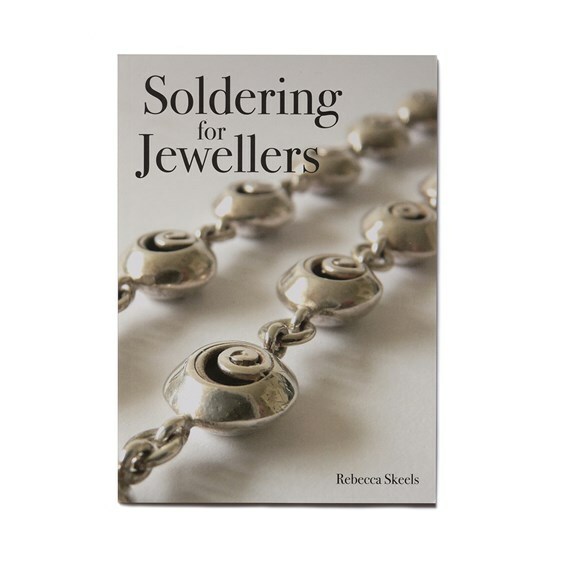 My friend Rebecca Skeels who has written a book on Soldering for Jewellers, suggested to Crowood Press, that it might be a good idea to ask me to write a book on polishing. I felt it was a natural step, so I started writing my book with advice from Rebeca. She checked my book at 8,000 words to make sure I was on the right track and continued to mentor me right to the very end. Is your book suitable for jewellery making beginners? Definitely, as it contains a lot of the questions I get asked every day - if I spotted a student polishing wrong I would take a photo. I have a few PMC craftspeople come along to my courses now, so I was able to learn on the job and gain experience. Because of my consultancy work, I get to polish all sorts of different metals in all the variations. Ever discovered by mistake when you buy a buffing machine and you fix the spindles on, they have a left and right side, if you don’t do it right, the tools fall off. I discovered mops being stuck on the machine basically because people get confused what way to screw on and off. 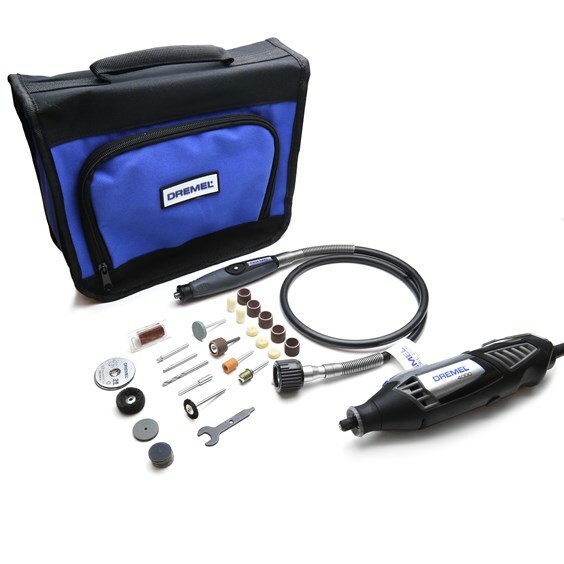 Popular questions are always about Dremel or Foredom motors, mostly used by hobbyists to start off polishing. What key areas do you cover in the book? 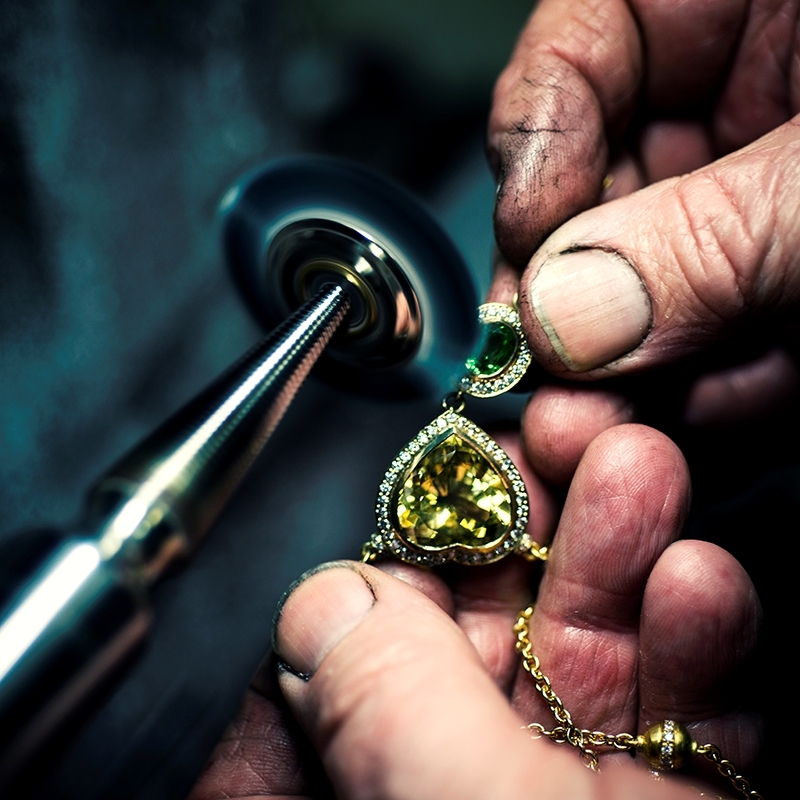 What is the importance of a professional finish for jewellery? Design and preparation is a good start, don’t make things impossible to polish. I firmly believe people create to their abilities, so if they can’t polish to a professional standard it shows - for example not polishing inside a wedding band. Create whatever finish you like to do on the outside but always polish inside rings or bangles, you can bluff your way out of it if you want but it lifts your game and shows you are serious about what you create. 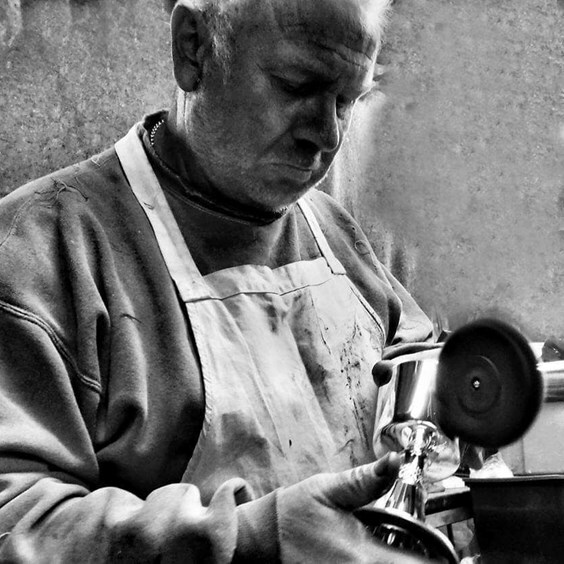 As a freelance precious metal polisher, what is a typical working day for you? My days are very varied, if it’s a day at Theo Fennell, it usually starts off with a meeting with the workshop manager Ian, we sort out deadlines for the day, it’s always prearranged and it’s normally for urgent jobs on the day. I get to polish anything from a silver postcard to bespoke high-end jewellery. Another day could be waking up in a different city or a different country, to teach perhaps at The School of Jewellery Ireland or The Van Tol & Breet Academy in Den Bosch in the Netherlands. I usually start with a short presentation and then work with each student to enhance their designs. There seems to be no typical day for me as you often find me polishing a major sports trophy on a Sunday hidden away in my workshop, trying to hit the next deadline. What is your favourite polishing technique and why? I tend to use an ancient technique of polishing silver cutlery, we call it sanding. Vegetable oil mixed into a firm pumice powder mix used with a leather or felt bob, I describe it as rubbing your tummy and your head with the other hand at the same time, I used this description in my book and was asked to remove it - when I show off the skill, everyone agrees that it describes it exactly. It’s a great method for removing hammer and file marks and once done, you move on to the next stage of mopping and you know it’s perfect. Other polishers prefer felting, another skill entirely and you use a felt, warmed up with a pumice block until smoking, then apply Tripoli. It’s great for keeping edges crisp, so it’s used on boxes and flat edges. This skill is easily transferred to jewellery whereas sanding is not but I was a silversmith’s polisher first and was trained this way. In my next company (Stuart Devlin) I moved onto never using this method, 7 polishers were all felting the new modern way in the ’70s. You have polished and restored many historical items - tell us more about these! The Royal Society mace was an interesting project, the silver fire gilt mace was a gift from King Charles II in 1663. King Charles was the Society's 'founder and patron'. It had never left the building and I was instructed if I take on the project, I was not allowed to remove it as it has been there since 1663, so I worked in a very grand library. I was preparing it for a ceremony for Prince William as he was made a Fellow as many of his Royal family before him. I was also asked to refurbish the metal on the Charter book. It contained signatures such as Isaac Newton, Charles Darwin, Christopher Wren, Sigmund Freud, Winston Churchill, Richard Dawkins, David Attenborough, Tim Berners-Lee and many others. Such a rare treat. The most famous piece is the Grand Punch Bowl in the Jewel House of the Tower of London. I was honoured to be able to restore this amazing creation because I worked for Garrards, The Crown Jewellers at the time. It has influenced what I am today. The bowl had 110 different models such as Bacchanalian cherubs, unicorns, lions and shellfish above and below sea level, fire gilt which is now banned as it uses mercury amalgam and most craftsmen died young. It was so big you could have had a bath in it and weighed a quarter of a ton, 257.23 KG, made by John Bridge (1755-1834) silversmith, it took 10 years to make and was finished in 1830. It was then used for Royal Christenings with water transported from the River Jordan, until Queen Victoria had a ladle made for it and it became the Grand Punch Bowl, the full story is in my book, but I was under armed guard in the Tower for 11 days whilst doing the job. How has polishing evolved over the years and what can you predict for the future? Up to a few weeks ago I would have said, polishing was going to be a forgotten art, I recently judged for the Goldsmith Crafts and Design Council and can see my craft is in safe hands. I am hoping with my book being so popular, it will revive and standards will become higher, it’s not taught in the universities for some reason they do not see the importance of the skill and I can see it being dumbed down with 3D Cad students that do not understand the importance of preparation mixed with their designs. Suddenly discovering that it’s impossible to polish to an acceptable standard, so they use the rustic approach which is confused as an organic finish. Hopefully, standards will be kept up by the apprenticed craftsmen of the future. "I was also asked to refurbish the metal on the Charter book. It contained signatures such as Isaac Newton, Charles Darwin, Christopher Wren, Sigmund Freud, Winston Churchill, Richard Dawkins, David Attenborough, Tim Berners-Lee and many others. Such a rare treat." Tell us about your experience working with jewellery designer, Theo Fennell? Working with Theo is the best move I ever made, he allows me to be so much more creative, he is always on hand to speak to about an idea of a different finish I have in mind. He knows everyone by name and has a little story to tell about each one of us to his clients. We tend to play along with him, it’s all part of the theatre of a workshop tour. We have a good team in the workshop and design studio and it’s a testament to Theo the long service of each member of the team, most are over 30 years and I am the newest out of the craftsmen at 16 years, there is a really cool vibe to workshop, we now have Jordan our apprentice diamond mounter who is adding a different dimension to our flagship workshop in Chelsea. As a tutor, what advice would you give to those wishing to pursue a career in polishing? You need to start with a good foundation course such as the one at The Goldsmiths’ Centre very much like I started off in my pre Apprenticeship course in Rochester college of Art and Design. One year course gives you the grounding you need to move on further, as usual polishing is hardly touched on during these foundation courses, so you won’t discover if it’s something that you would like to do for the rest of your life. It just gives you the skills to understand how things are made, which helps you create the better finish. You will need to approach a larger company as polishing is learnt by a repetitive system, so you need volume to learn the basics, you can’t expect to be polishing a £2 million pound necklace in 6 months time. In the 70’s it was more of a factory environment, 7 polishers to 28 silversmiths - you can imagine the volume of work created. Now we say a ratio of 4 to 5 silversmiths to keep one polisher employed. Sadly polishing apprenticeships are few and far between and now the skill is passed on as part of another skill, such as a jewellery mounter, in a way it makes sense just to prep as you work and then, in the end, it’s complete and hand it over to be finished by a skilled polisher who is more of a specialist. I get to teach apprentices in their last year for a day of polishing as part of the apprentice week at the Goldsmiths’ centre, it helps them for later in their craft career. Tell us about your workshop! A very small box room with a ready-made polishing machine with extraction and lights, it’s 2 speed very handy for platinum sitting on a stainless steel bench, it’s a nice height for standing or sitting, I also have a flexible pendant hanging to my right side for easy and quick access with all my polishing tools in different boxes which are labelled. I have overhead extraction with an ultrasonic and sink, with a three in one plating unit, containing, rhodium, yellow gold and a caustic cleaner. The other side of my workshop is a put-down space with a dryer. I have a strip light just above my head so I can detect everything is crisp. 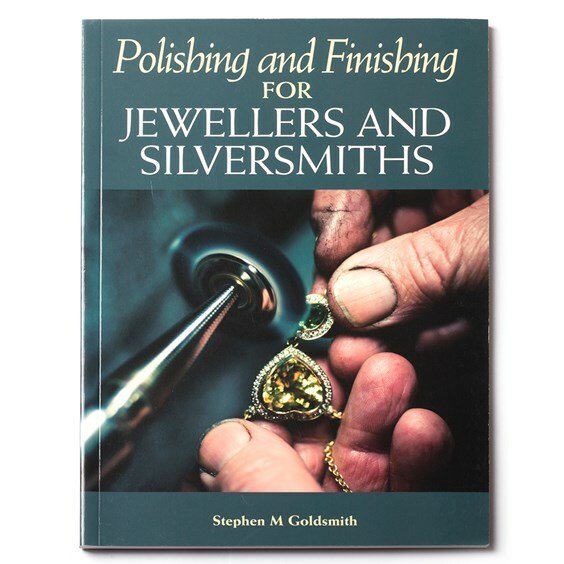 My book called 'Polishing and Finishing for Jewellers and Silversmiths'. Never imagined it would be so popular, it was a long haul for me, up to way past midnight typing with one finger and out by 6.30am back up to London, it took me around 18 months to write in the end. Then I had to wait 6 months for it to be published - this is when the inner gremlins kick in of self-doubt until it was out there at last. 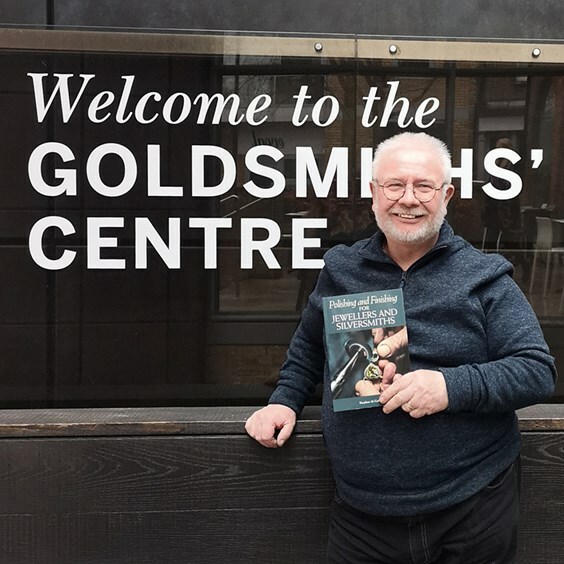 If you want my book brought to life the best way is to book onto one of my polishing master classes, then you will definitely enjoy polishing. What has been your biggest challenge throughout your career? Boredom and repetition believe it or not, so pleased I don’t get to polish long runs any more. I used to have over 100 of the same item to polish, used to dislike it, so I break everything up into batches of 10 and then onto the next run. I know the barrel is used often for long runs of work but you can’t get away with it at my level. What are the benefits of using an ultrasonic cleaner for cleaning jewellery? It’s a must, I have always had one and a steam cleaner combination but if there is a choice to be made the ultrasonic every time. If your work is dirty you won’t sell it. I prefer ammonia-based cleaners much more efficient but they are very anti-social, so you need a good extraction system. What tools and supplies would you recommend to a budding silversmith on a budget? Definitely a pendant/flexible motor for polishing, it’s so handy for so much more. You can use it to drill, such a versatile machine, ultrasonic is a must and a barrel tumbler or a vibro polishing machine if you have extra cash to splash, it’s quicker. A good set of emery sticks going all the way through the grades, starting from 180 up to 12000 grit the more you do the less you polish. I use a Vienna lime powder instead of a silver polish, just mix with water into a stiff paste, apply with a soft goats hairbrush. Anyone who has been on my master class now swears by it. For polishing it’s a black bristle brush with emery brushing compound, then a cream coloured calico mop such as a B mop used with Tripoli the brown bar, then onto a white calico reflex mop with rouge plus a rake to keep your mops clean, this is the minimum for polishing. I notice a lot of matt finishes being used now, so be consistent. What advice would you give for using flexible shaft tools? Don’t bend the shaft, always hang it up at a good height, there are brackets to buy, this stops you wearing out the shaft inside, also get a multi chuck - so handy. Don’t put your foot on the peddle too much, you don’t need to go 100 mph to polish. I never use the steel brushes, only brass ones, black bristle, goats hair beware there is a stiff white brush that looks the same don’t be fooled into thinking it’s soft it’s usually synthetic and stiff. I use all sorts of different shapes to get into different areas such as the end brush to go into a collet of a setting, I like to make the collet shine inside as it gives the gemstone more life. Don’t be tempted to press too hard it wears your tools out very quickly. 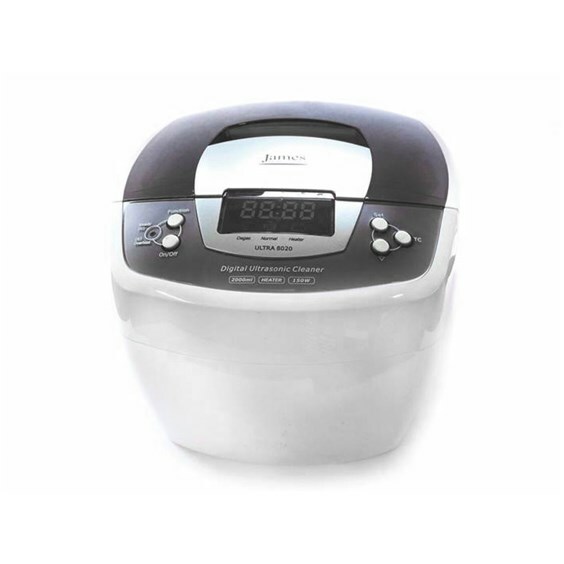 The Ultrasonic Digital Cleaner cleans dirty jewellery to a sparkling shine using millions of tiny bubbles! Would you like to write another book in the future? Everyone has been asking me about a second book? It’s always the way just like a Bond film, always wanting a follow-up, my book was always meant to be 2 separate books, one for silversmiths and one for jewellers. I had to create a combined one, which was extremely difficult trying to cram in the 2 completely different subjects into 98 pages, I was told my word count was 25K, I stretched it to 28K and my image count was 100, I really stretched that one to 162. I must say my publisher Crowood Press was very patient with me. 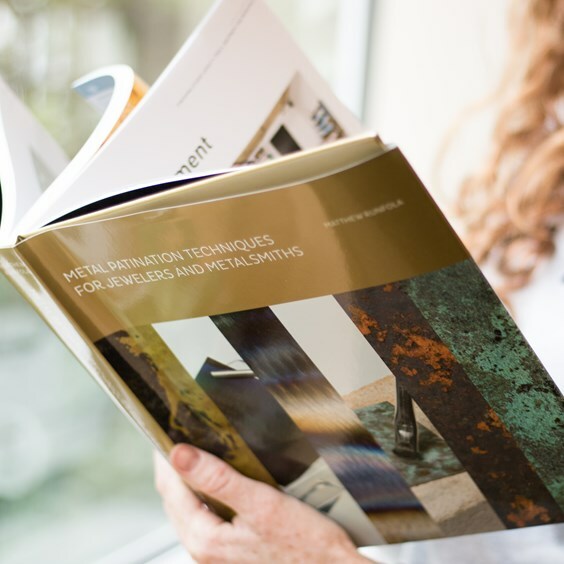 My book is part of a series of books, quite a lot of the authors come from the Institute of Professional Goldsmiths. I won’t be like a politician and not answer your question with a question! Yes, there is another book in my repertoire as I removed 10K words and too many images just to get it printed! At Kernowcraft, we offer a range of sanding, polishing and cleaning supplies for your jewellery making needs. From sanding papers, polishing papers, silicon polishers to the Dremel Multi Tool featured above. Jewellery making books are a great resource to have at the bench while making. Learn new techniques and gain inspiration from our range of book from soldering, metal clay to stone setting.